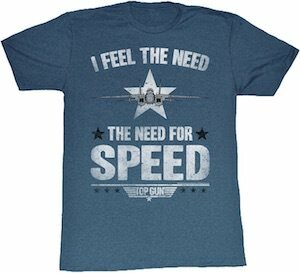 If Iceman is your favorite of the classic movie Top Gun then this t-shirt could be perfect for you. This men’s t-shirt is grey and shows the helmet of Iceman with under it the famous Top Gun logo with the red stripes. The whole shirt looks cool and will bring back memories of this amazing fighter plane movie. You can get this grey Iceman t-shirt in men’s sizes Small – 3XL and all sizes are made from 100% cotton to be sturdy and comfortable. 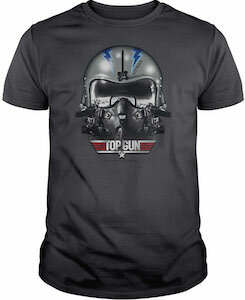 Top Gun was one of those movies we should never forget and this Top Gun t-shirt will keep the spirit alive. Top Gun fans are gone like this t-shirt. It’s a dark grey t-shirt with on the back a small Top Gun logo and on the front a famous scene of this classic movie. You can see two planes the bottom one a MIG 28 and above that upside down F14 Tomcat flown by Maverick. As Maverick was not allowed to shoot the MIG out of the sky he decided to flip him the finger and that is why above the picture it says “Flipping’ the Bird”. Made from 100% cotton this Top Gun t-shirt comes in many sizes from Small all the way to 5XL. Need to flip a finger? 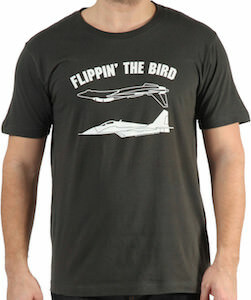 Then wear this Top Gun Flipping The Bird T-Shirt. Kenny Loggins sang it best, “Gonna take you right into the danger zone”. This t-shirt will skyrocket you into the danger zone of being so good looking. Fly with Maverick, Goose and Iceman in this cool Top Gun t-shirt inspired by the 1986 movie. The entire t-shirt looks like a perfect sunny day with blue skies and perfect white clouds. It features a F-14A fighter jet on the front and back and includes the Top Gun logo. This fantastic t-shirt comes in sizes Small to 3XL so you and your buddies can put your call name on the back and go out in style. Stand at attention when wearing your Top Gun Sublimation T-Shirt. For any costume party or halloween it is time to step up your game and enter the danger zone, throw on your aviator sunglasses, suit up and get out there. This is a suit that looks just like the aviator suit worn in the killer movie Top Gun starring a young Tom Cruise, find a rugged and durable looking coverall suit with patches all over it like the official movie logo Top Gun, Wingman, Tomcat and the American flag. You can get this awesome Top Gun Wingman costume in a wide variety of adult sizes. It’s the Highway to the Danger Zone, so watch out you navy pilots, Cougar is coming through! Top Gun is one of the greatest movies of the 80’s and is still watched by many today. 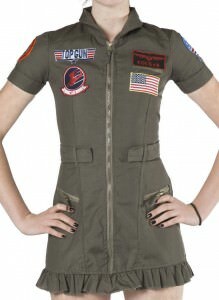 Why not dress up in a great dress that embodies all that is Top Gun. This costume is a short in army green coloring zipper dress. The dress has a frilly trim at the bottom and features 6 different patches on the shoulders and across the chest that are inspired by the movie. It comes with the zipper dress, aviators sunglasses and the “Cougar” name badge. It is slim fitting and comes in S, M and L.
Be one stylish Cougar for any occasion in this Top Gun Ladies Cougar Costume. Our first favorite radar intercept officer, LTJG Nick “Goose” Bradshaw is definitely someone you would want on a T-Shirt, especially a cool Top Gun T-shirt. This t-shirt features the Top Gun logo on the left chest. It has a side profile picture of “Goose” with his thumbs up, showing us all is good. Behind him is a big yellow sun and goose is written across the shirt below the picture. It is 100% cotton, and ranges from sizes S to 3XL which means a size for everyone. 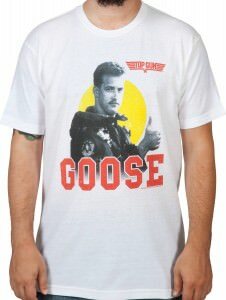 Give thumbs up to all you meet with the Top Gun Goose Thumbs Up T-Shirt. Who can forget one of the best movies of the 80’s? After watching Top Gun we all wanted cool aviator sunglasses and even cooler aviator nicknames. And how about one of the greatest soundtracks of all time? Remember those great times of 1986 with this t-shirt. This beige t-shirt has the vintage logo front and center with a sweet F-14 swooping in behind the logo. It is full of color and makes to stand a little more at attention when you wear it. Sizes range from Medium to 3XL and is 100% cotton. 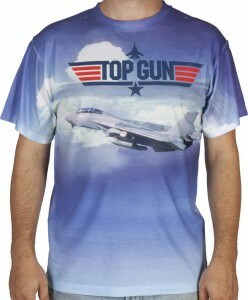 Show someone you’re in the “Danger Zone” with your Top Gun Vintage Logo T-Shirt. Are you and your kids fans of the 1969 television show Sesame Street? Is your favorite character the one and only big bird. 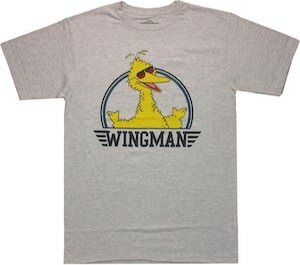 If so let Big Bird be your wingman while you wear this cool Big Bird wingman t-shirt. This grey Big Bird wingman t-shirt features a picture of Big Bird from the body up with holding his hands up wearing a pair of cool shades. Right under Big Bird is the quote ” Wingman “. It is 90% cotton and 10% polyester with a soft feel and a trim fit and is available in sizes Small to XXL. Big Bird loves to have lots of fun like roller skating, dancing and singing. He is also Mr. Snuffleupagus wingman and best friend.